Our long-standing cooperation with the festival and its organisers, Inizjamed, continues this year with events associated with our project Literary Europe Live Plus. 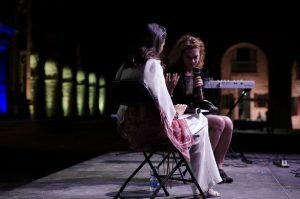 The festival is in its 13th year with a rich programme featuring the exiled Turkish writer Aslı Erdoğan and the Icelandic novelist, poet and lyricist Sjón. Other participants included Juana Adcock (Mexico/UK) and Clare Azzopardi (Malta), both selected as New Voices from Europe in 2016, Massimo Barilla (Italy), Jean-Rémy Gandon (France), the Frisian poet Arjan Hut (Netherlands), Laia López Manrique (Spain), Ali Thareb (Iraq) and Maltese authors Caldon Mercieca, Teodor Reljić and Philip Sciberras. 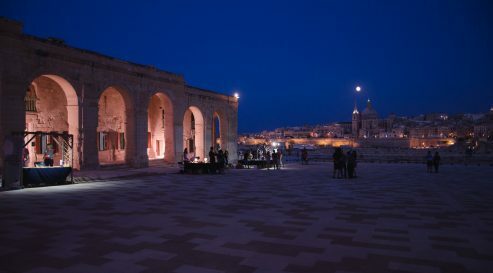 It was held in the spectacular new venue in Fort Manoel with panoramic views of Valetta. 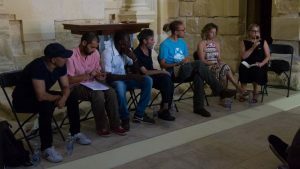 The festival starts with the annual LAF translation workshop and with a number of pre-festival events for the general public and for literary professionals. LAF director Alexandra Büchler moderates a session on Migration and Exile featuring two writers settled in Malta, the Palestinian Walid Nabhan, winner of the European Union Prize for Literature 2017 with his novel Exodus of Storks written in Maltese, and the Moroccan author Murad Shubert, Malian refugee known to everyone by his nickname Yayya, academic Dr Maria Pisani, co-founder of the NGO Integra, and Tamino Böhm, Head of the Mission Moonbird with Sea Watch. The session was coordinated by Jean Paul Borg who interpreted for Yayya. Find more on MMLF 2018 here and on Inizjamed’s Facebook page.